Education leaders across the state are joining forces to help students improve their financial skills. Pictured (left to right): Dr. Adam S. Green, West Virginia GEAR UP; Dr. Paul L. Hill, West Virginia Higher Education Policy Commission; Dr. Amelia Courts, The Education Alliance; James “Ikie” Brooks, Marshall University (student); Lesia Sammons, Mingo County Schools; John Perdue, State Treasurer; Christy Scott, West Virginia Bankers Association; Gina Joynes, State Treasurer’s Office; and Vanessa Keadle, West Virginia GEAR UP. Charleston, W.Va. – Education leaders across the state are joining forces to help students improve their financial skills. Earlier today, the West Virginia Higher Education Policy Commission (Commission) and The Education Alliance unveiled a new initiative, “Make Cents WV,” to provide financial literacy tools and resources to students, families and educators. The effort, which is led by The Education Alliance and funded by a grant from the Commission’s federal West Virginia GEAR UP program, will emphasize financial planning within the context of preparing for higher education programs. The Make Cents WV partnership leverages a variety of resources and expertise from education leaders across the state, including the West Virginia Community and Technical College System, the West Virginia State Treasurer’s Office, the West Virginia State Auditor’s Office, the West Virginia Association of Student Financial Aid Administrators, the West Virginia Bankers Association and the West Virginia Department of Education. High schools in Mingo County are serving as pilot sites offering guidance and feedback in the effort. To support the Commission’s goal of ensuring that 60 percent of WV high school seniors complete a FAFSA by April 15, 2017. 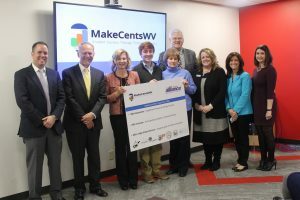 During today’s event, the partners in the Make Cents WV effort launched a new website at MakeCentsWV.org to serve as a resource for families, students and educators. The goal of the website is to grow students’ appreciation for the financial tools that are available to them and can improve their lives. The website serves as a clearinghouse for new and existing resources that promote wise and informed financial choices by learning how to increase savings, improve credit and build assets.